Judging from the number of comments to my post yesterday about the mushrooms, I thought I’d write some more about mushrooms. Hot topic. Who knew? Mushrooms are an outside thing. I like outside things. I only stay inside all day long because Mom is either too cold or too hot outside so she stays inside and I like being with her. We walk outside in the mornings at the mall before work, but soon the temperature will drop below Mom’s comfort level of 72 degrees and she and Debbie will go back to walking inside where they complain how cold it was running in from the car. I’ll have to stay home. I’m going to get fat so they feel guilty. But I digress. Back to the mushrooms. 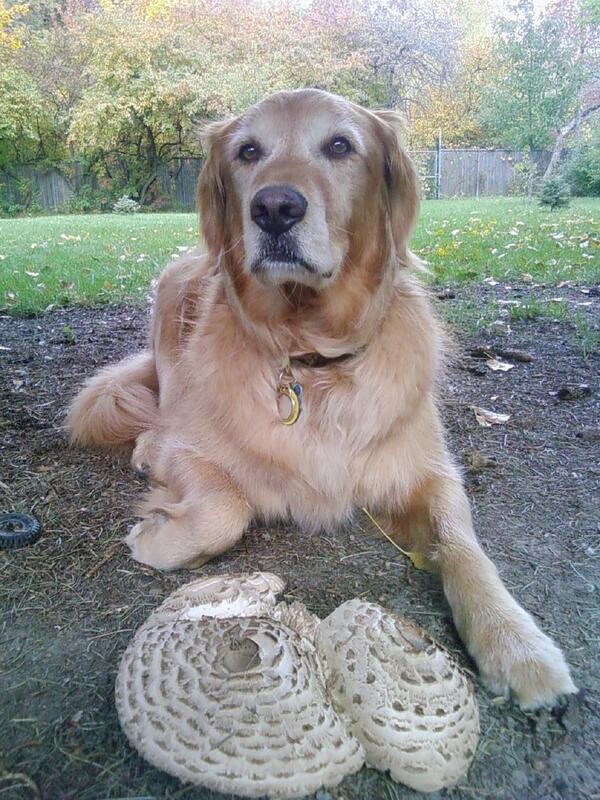 Mom went outside to take my picture by the new mushrooms. They came out of nowhere, as mushrooms do. I took a detail photograph so you could see what they look like up close. I haven’t noticed these kind before. I rather like the way I kept one paw in the photograph so you could see a little bit of me as well as the mushrooms. And this way you can see how big the mushrooms are. Not having opposable thumbs, however, made this photo of me taken by me more difficult than it looks. Those are very nice pictures, Madison. I particularly liked the one with you posing by the mushrooms. Tandi and I were inspired by your pictures, and when I got home from work this morning, Tandi took me outside so I could find mushrooms and other things to photograph while she cracked some more acorns. Love the blog…..esp. Madison’s contributions! I have 2 bassetts that are my best friends. The older one used to crack Black Walnuts that the squirrels threw at her in hopes to get her bark……she was busy sleeping! Black walnuts are incredibly difficult to crack….at that point I thought it was very good she is VERY friendly to all moving creatures! Madison, what a treasure trove you have in your backyard! These mushrooms remind me of soft brown tipped feathers. Must say you take very handsome pictures! Naturally!!!!! Oh, Madison, I have such a crush on you. You’re so handsome! Why don’t you write a book? I’d buy it in a heartbeat. But, of course, it would have to be pawtographed. Have you ever considered writing a book through the eyes of a dog? Maybe in your next life!!!! !LOVE, LOVE, LOVE hearing about life with Mom from yur prospective!!! About those squirrels… there is hope, you know. I am certain of this because one of our dogs, Chocolate, saw a squirrel sitting on the fence one day and raced to get it. He didn’t stop soon enough, so he banged into the fence. The squirrel fell off onto Chocolate’s nose. Chocolate and the squirrel were both so surprised that they didn’t know what to do. The squirrel ran off and all Chocolate had to show for it was a little scratch on his nose. So, don’t despair! One day a squirrel could be within your grasp (even though you don’t have opposable thumbs). By the way, my Newfies, Ruby and Blue, told me to say “hi” to you. Your mom was at my quilt guild to teach a class and we had a nice chat about our dogs. 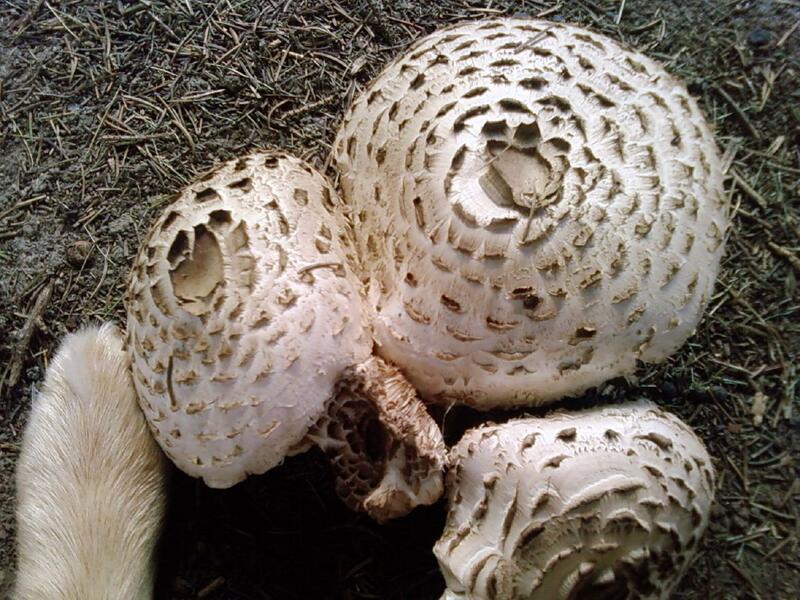 Not eating mushrooms is a good thing – I don’t think I’d like them anyway. Mom never notices the little presents from the rabbits so I get to eat them – they are delicious. I also really like the presents the horses leave especially when they are frozen, but when mom realizes what I am doing she acts really grossed out and the next thing I know, she is shoving something she calls a “deworming pill” down my throat. It doesn’t stop me though. I think that pill must also be because of the little voles I dig up from under the snow in the winter. They are really sweet. I don’t like rats though; they are fun to chase. I can’t catch any squirrels either. It is my job to keep them out of the bird feeders and off the deck and I am really good at that. When I was younger, I knew they were there before my mom did, but now I’m old and sometimes she has to tell me they are out there. I’m still pretty fast though – but man, those squirrels can move! I’m pretty good at ground hogs though. I’ve caught of few of those. Once, one of them bit me in the tongue!!! It hurt like crazy, which I thought was bad enough, but then Mom took me to the VET!!!!!!!!! Mom thinks I should chase the deer out of the yard too, just like I do the squirrels, but they confuse me. They don’t look like squirrels – they’re kinda tall. I keep looking down trying to find them and by the time I figure it out, they usually have left the yard. So, then, I don’t know what I’m supposed to do. Should I chase them? But if they’re out of the yard, then Mom will get mad. I’m not supposed to leave the yard. And besides, they kinda remind me of cows and I’m afraid of cows. I don’t think I’m afraid of deer, but I’m not sure. Like I said, it is all very confusing. Rabbits are fun! They wait for me and just when I think I might get one, they run off. They are even faster than squirrels. Way to go Madison .I’m looking to seeing you in December. Does your mom ever bring you to her “evenings with the quilters”If she does, you can sit on my lap. If you truly want to catch a squirrel, you will, When I lived in Michigan, actually about 30 miles from your yard in northern Genesee County, I had a beautiful Golden named Mollie and three acres of woods for her to hunt. She just found the squirrels so annoying because they sat on branches above her reach and chittered and sassed her as she barked. Then they would do their acrobatic routines and she would be even more annoyed. Everytime she went outside, she would race to the trees, barking all the way, and chasing the squirrels from tree to tree. One day fate worked in her favor, a squirrel was a little slow, and she caught it! Amazing! Both were startled but before Mollie figured out what to do with her catch, the squirrel bit her on the nose. That certainly saved the squirrel from a good thrashing, well deserved, but scared me, the mom, into worrying about possible rabies virus. So the mom praised the beautiful Mollie, disinfected the bite, crossed her fingers after a call to the Vet, and all was well. Mollie did lose her “taste” for squirrels after that, and while she still watched, barked, chased after them, Mollie no longer leapt as high on the trees. So, darling Madison, be careful out there! There’s a reason they are in the trees and you are on the ground. Thanks for the memory rekindled, and hugs to you, you beautiful hunk of Golden. Madison, I’ve just subscribed to your Mom’s blog and so far I love it. Specially the parts you write. I don’t have a dog right now but my cat would like to meet you. She would like to go outside too, but alas she is an indoor only cat….all she has to chase is her tail and she does do a good job of sniffing out her food. Keep on taking pictures, you’re one beautiful dog. Mushrooms in MY lawn are perfect for golf practice! Hit squarely, they explode and spray magnificently into the air! Hopefully the spores will insure me a good crop next year! Madison, I’m simply in love with you! Hey Madison, Just wanted to tell you not to give up on the squirrels. My sister and I treed a squirrel once and waited down at the bottom of the tree for it. The dumb squirrel got tired of staying in that one tree and tried to jump to one that turned out to be too far away. We were on it like dogs on biscuits!!! One down, many to go. My sister and I also made a great team when tracking down those pesky ground hogs. My neighbor loved us for that as he had horses. So, hang in there. You never know. (PS: Don’t tell your Mom but we love to eat those little rabbit snacks too along with earthworms and other bugs. I don’t care if they are dead or alive; I even ate a live locust this past Summer. My sister is a little more discriminate than I am. Heck, I even ate baby mice once. Mom was really mad at me for that.) Maybe this all wasl too much information … at least for your Mom but maybe not you??? Madison, The squirrels and rabbits are okay to chase. As you already know, stay away from the skunks. If you don’t, tell Mom the next time she should wash you in tomato juice. It takes the smell away. I know cause I played with a skunk one time and that’s what my Mom used. Madison, you are so talented to poise and talk your picture with those sh’rooms! I hope you find more because I love reading your stories. They are much funnier than your mom’s, but lets keep that a secret from her, OK? Squirrels aren’t much fun if you actually catch them. I’m getting a little older so most of the time I just watch them. Mom says they are dog TV. When we are taking a walk, she gets impatient because I stand at the base of the trees and watch them running up and down. If they don’t move for awhile I bark to motivate them. Please keep writing with your Mom. My Mom always reads me your letters. I love these postings by you, Madison. I like your curiosity and observations of your world. Keep it up because in these stressful times it’s nice to see things as you see them. Hi Madison, The squirrels here love being chased, they wait until the last possible moment before running up a tree, then I stand at the bottom of the tree and wait patiently for them to do it all again, sometimes they do. Yet, somehow I’ve never caught one. But I do have fun. I have handed (well, strictly speaking mouthed) my Mum a foxcub. It was cute and I just couldn’t say no to it. Mum and her friend were rather distressed and casued such a fuss, the words fleas, distemper and rabies started flying around and so I ran off with the cub still in my mouth because it was just too confusing. Mum persuaded me to drop it in the end but why I have no idea. Rabbits leave a veritable buffet for me in the fields by our house and I don’t give a hoot what Mum, Dad or the two smaller humans say, a buffet is there to be grazed on. Thank you for sharing your photos with us all and your views on life. Look forward to your next installment. Servus (which means Bye in Bavarian German) Charley with Mum Rachael. Another huge Madison fan chiming in! Love your posts, Madison! My black lab has caught a squirrel and several rabbits and birds. The squirrel bit him on the nose before dying. Yup, he still chases squirrels.